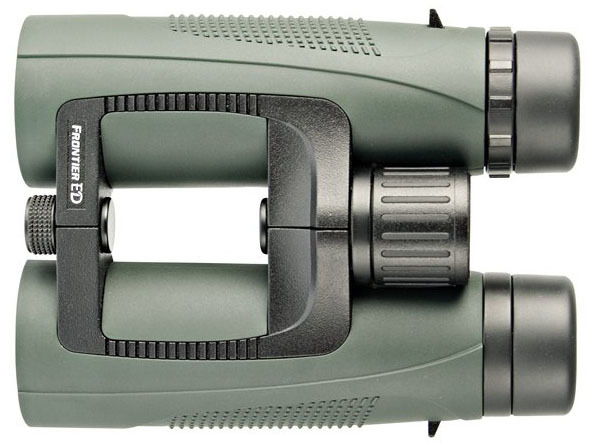 The test article is Hawke Sports Optics (www.hawkeoptics.com) “Frontier ED” magnesium body binocular, in the green body edition. They are Hawke #HA3782, eight power, with 43mm objective lenses. The main feature is the extra-low dispersion (ED) glass, which promises better lateral color correction than possible with conventional glass. ED glass, as best I can determine, came about in the mid 1970s. Chromatic aberration is at least a five dollar word, unadjusted for inflation. Chromatic aberration or later color refers to color fringing due to the optic's inability to focus all three primary colors of light to the same point. To reduce weight, Hawke uses a magnesium body for this binocular and what they call their open hinge design, the result of which is that these binoculars are close to what you would expect for a typical 8x42mm binocular in weight. They are waterproof with fully multi-coated lenses, the usual set of features expected in higher-end binoculars. They are about an ounce lighter than the Nikon 8x42 EDG binoculars, for example. Several thing are impressive about the Frontier ED binocular. The overall build quality is confidence inspiring. The center-knob focusing is smooth with an excellent feel of slight resistance, as opposed to the loose and sloppy focusing I've often seen in lesser binoculars. The twist-up eyecups have two extended positions and they stay in place. Too many binoculars have unstable or instant collapse eyecups that can drive you nuts. These don't, a very good thing. The profiled indentations in the body of the binoculars for your thumbs make them easy to handle and the checkered portions of the barrels make them easy to hang on to. The diopter adjustments for the right ocular portion aren't the sloppy twist type; instead they are crisp click adjustments that stay in place once you set them. I spent several hours looking at bushes, grass, signs, into shaded areas and so forth. The images are sharp and crisp and if there is any fringing it is beyond the ability of my eyes to detect it. I did my best to look at what could be considered the closest thing in the marketplace today to this Hawke set. What I came up with is the Vortek Talon HD 8x42 that is very similar in features, or in advertised features, anyway. Check it out for yourself, the Vortek is so similar in design if not a clone, it is as close as you'll get. Yet, the Vortek has a MSRP of $539, a street price of $440 or so, making the Hawke Frontier HD's a deal by comparison. Binoculars, historically, have run the same path as riflescopes. There is a world of difference between the opera glass, disposable level of binocular and mid-range price point sets. If it comes in a bubble pack for $69.99 at your local chain store, odds are it is going to be more toy than reliable gear. That's my experience. Yet, beyond a certain level in optics, as in most products, you get into the realm of diminishing returns. Amateur astronomers, for example, may require better optics than boaters, with hunters and bird watchers somewhere inbetween. Where these Hawke units are priced at, about a $350 street price, I have no problem recommending them. They are certainly worth consideration and I can't think of anyone who wouldn't be delighted with them. If the image they produce doesn't sell you (I believe it will), the overall ease of operation, build quality, ergonomics and positive controls and adjustments should seal the deal. Copyright 2011, 2016 by Randy Wakeman. All rights reserved.